Want to add some beach style to your home? Our "Coral Allover" stencil pattern is one of our favorite nautical designs. Beach dÃ©cor brings a calming comfort to any space making this coral stencil a great choice for your next stenciling project. 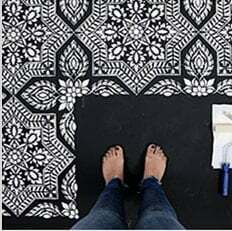 Try this beach style stencil for tablecloths and curtains! This lovely coral pattern looks stunning on accent walls! This Coral stencil pattern comes with an additional FREE Top Edge Coral stencil. Use it to fill the gaps close to the ceiling line after your main wall pattern is stenciled and to get into all the tight places when finishing your wall pattern. Most of our stencils do not require the use of spray adhesive, and this wall pattern is very forgiving. The possible paint bleed will be almost un-noticeable. If you want to minimize paint seepage or are using high contrasting colors, spray adhesive is very helpful (Elmer's spray adhesive seems to be the best). Make sure you shake the can well and lightly mist (not drench) the stencil, and let it dry for a moment before positioning it on the wall. This step will prevent the adhesive residue transferring to the wall. You'll need to re-mist the stencil after a few repeats. Note: you will still need to hold the stencil in place with a few pieces of blue painters tape! Adhesive by itself is not enough to hold the stencil on the wall. Adhesive clean-up tip: Spray the stencil with Simple Green or Dawn Power Dissolver to help to remove adhesive residue. Our Blog "Stencil Stories" is packed full of illustrated tutorials and inspiration! Please check it out to get some decorating and stencil ideas and learn new stenciling techniques! We post new decorating ideas daily! And make sure you watch our short step-by-step Video Tutorials! You'll find them extremely helpful for your stenciling project. While prior experience is helpful when working with repeat interlocking stencil patterns, even beginners get great results! Try this Coral stencil with our new Clip-on Stencil Level, (sold separately) and discover how easy it is to achieve perfectly level results without dealing with all those bulky heavy bubble levels and annoying laser levels. We cannot recommend the Level enough, it's a real time-saver and is so handy! This stencil is made out of durable 12 mil clear plastic stencil material. This material is strong but flexible, reusable and easy to clean. We love it so much more than standard 5-8 mil Mylar! It's not brittle, user friendly and just so easy to work with. In our many years of professional stenciling this material has proven to be far superior in quality to any other stencil material we used. Our customers love it too, and we are sure that you'll notice the difference! Our stencils will last a long time and are a pleasure to use.